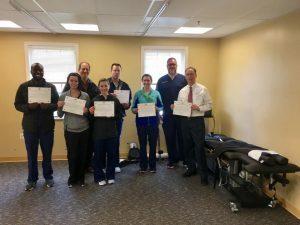 Congratulations to Dr. Paul Ettlinger of Heath Quest Chiropractic near Baltimore, MD for opening his 2nd clinic with a KDT Decompression system! All of the staff and docs became kdt certified as well to better serve their patients. https://kdtneuralflex.com/wp-content/uploads/sites/3/2014/05/kdt-logo.png 0 0 Courtney Buffy https://kdtneuralflex.com/wp-content/uploads/sites/3/2014/05/kdt-logo.png Courtney Buffy2017-02-28 18:37:362017-02-28 18:38:05Health Quest Chiropractic opens 2nd clinic with KDT System in Baltimore, MD!